“Crazy Heart” is an interesting story, as it seems to be this year’s little movie (i.e. “The Wrestler”) that’s showing up at the last minute and affecting the Oscar race, certainly for best actor. In it, Bridges plays an aging country singer who drinks too much, smokes too much, and drives around in a beat-up Suburban playing gigs at bowling alleys and tired clubs. We’ve seen this sort of character before, but the beauty of this performance is that Bridges makes it fresh; we hear every day of his hard-lived life in his voice, and see it in his weary yet courtly smile. At a time when everyone’s talking about “Avatar,” it was a nice reminder of the best kind of special effect: the kind that magically happens between an actor and a camera, with nothing in between. Bridges, who’s now 60, is having a good season; he can also be seen in a nicely lunatic role in “The Men Who Stare at Goats.” “Crazy Heart” will open in Seattle January 15. 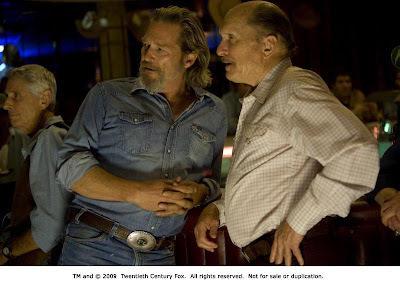 Bridges in “Crazy Heart,” with co-star Robert Duvall (who, yes, won an Oscar playing a broken-down country singer, in “Tender Mercies”). Photo copyright 2009 20th Century Fox.